I once considered myself a fan of stoner rock and metal. And that’s mostly because Mastodon slayed (to each his own opinion, but the latest album was crap). However, when I tried and ventured into the deep haze of the genre, I found out that almost every band in the stoned area was pretty much just that: stoned, and deserved to be just that: stoned. Of course I found a few, but that are good and worthy: Colossus, or Chiefs, for example, make great stuff! But that’s probably one in a hundred band, if not one in a thousand. 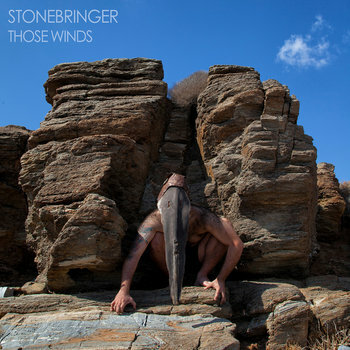 Enters Stonebringer, from austerity-stricken Greece, with just what I like: big fat riffs, a tad of droniness, catchy melodies, uncommon time signatures and songs that can go for a while (like the last song, Emerald, clocking at 9:05 minutes). And if that’s the very definition of stoner, then the majority of bands get it wrong, or maybe they just can’t pull it off. Anyways, even though the description says “progressive post-metal” on their bandcamp, I still label that as stoner metal à la Mastodon’s Blood Mountain, and that’s one hell of an achievement. Of course, there are only so many parallels you can draw between the two, but it made me think of that album in particular. Those Winds is the band’s debut album; they’ve released an EP entitled Ocean Of The Brave before that, which I have yet to listen to. Now let’s get down to business, the actual music! First of all, of note is the quality of the singer(s). It’s really important, in any band, to have a decent singer, because they’re really at the forefront. Here, they’ve got a good voice, and can sing memorable melodies and harmonies On the guitar side, we’ve also got quality riffing and song structuring/building. Really, nothing more to say there, same goes for bass and drums. Although there’s nothing groundbreaking or novel, it’s all done with care and attention. Those Winds is definitely an album to get if you’re a fan of stoner music, or progressive post-metal or whatever. We recommend you check it out!